Mayor Bill de Blasio still vows to work to improve relations between the NYPD and minorities, despite the most recent incident of a black man dying while in police custody after being arrested for selling cigarettes on a Staten Island street. Facing his first significant test in trying to improve relations between police and minority communities, De Blasio said Monday that he believes the troubles stem from racial tension that defined his predecessor's 12 years in office. "If you talk about the last decade or so in the city, was race a factor and a problem in the relationship between police and community? Obviously it was," de Blasio said Monday at a news conference in his first comments about the case since returning from a week-plus vacation in Italy. "There was a growing tension and a growing disconnect between police and community all over our city. And that is not an acceptable state of affairs." On July 17, the day before de Blasio was schedule to depart for Rome, a video emerged of police confronting Eric Garner, 43, for selling loose cigarettes on a Staten Island street. The video shows Garner being placed in an apparent chokehold and being knocked to the ground. Garner repeatedly screams, "I can't breathe!" He died a short time later. The cause of the death has not been determined. 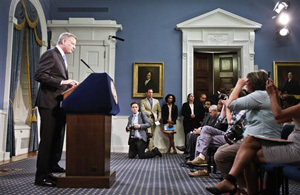 On Monday, de Blasio never mentioned former Mayor Michael Bloomberg by name but repeatedly referred to his three terms in office as a flashpoint for racial tensions surrounding the New York Police Department. He has blamed much of it on the police tactic known as stop-and-frisk, which allows police to stop anyone they believe is acting suspiciously. The tactic's critics believe it discriminates against black and Latino men, and de Blasio has toned down its usage. "We're not going to have racial profiling be part of our approach to policing," said de Blasio, a Democrat, at City Hall as he stood with Police Commissioner William Bratton. He added that he took responsibility for improving things, saying "the buck stops here." Several City Council members have said they believed race was a factor in Garner's death. Bratton said last week that he did not. Though signaling support to minority communities that overwhelmingly backed him on Election Day, de Blasio also tried to perform a delicate balancing act; in an effort not to alienate the 34,00-person police force just seven months into the job, the mayor was quick to say that he believed that most NYPD officers "do their job well." "Anyone who is accused of anything, they deserve due process and democracy," the mayor said. "That is true for any individual New Yorker, and that is true for any law enforcement professional."